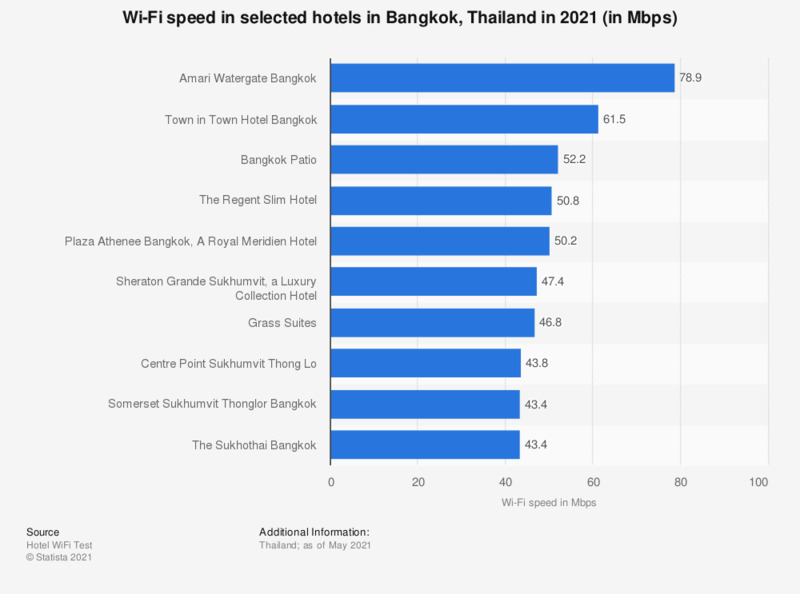 This statistic shows the Wi-Fi speed in selected hotels in Bangkok as of July 2018. Of the hotels tested, Plaza Athenee Bangkok, A Royal Meridien Hotel had the fastest Wi-Fi in Bangkok with an expected speed of 50.9 Mbps as of July 2018. The source does not provide a publication date or date of survey. The date given is the date accessed. * Expected speed indicates the speed you would likely get at a randomly chosen time of the day. Hotel Wi-Fi speeds are submitted to the source website by guests using the services. The source states that only reports that have been verified by smart algorithms are included.